In our fast-paced society, there is something beautifully simple about the slow process of preparing matcha the traditional way. 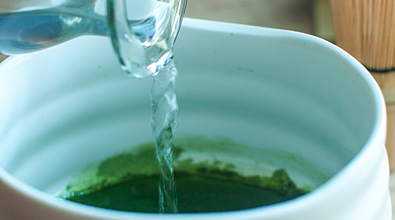 Though it's a little more complicated than sticking a tea bag in water, this time tested technique for brewing matcha can be mastered after a little practice and will provide you with a rich, creamy tea that will soothe your taste buds and your soul. The traditional Japanese method of making matcha requires very specific tools. Though it is possible to use western equipment like a whisk or mini immersion blender, Japanese bamboo whisks simply make a lighter, frothier tea. For this reason we recommend using the traditional Japanese tools for the best taste and full matcha experience. -Below is the equipment needed to make a tradition cup of matcha. - Matcha Bowl: Usually shallow and ceramic, must be large enough to hold four fluid ounces. 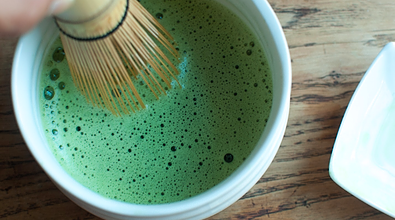 - Matcha Whisk: Traditionally made from bamboo, used to whisk the powdered tea into a rich foam. - Teaspoon (Matcha Tea Spoon): used to measure the powdered matcha into the tea bowl. Usually much longer and differently shaped than western spoons. - Whisk Holder Used to sift out the chunks of matcha to make the powder perfectly textured. 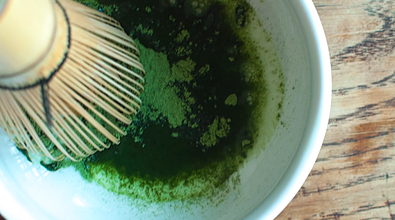 Preparing matcha should be a calming, centering experience. Enjoy the beauty of the matcha preparation process and don't get lost concentrating too hard on following the steps. Remember, in essence all you are doing is adding water to tea in a perfectly optimized way. If you are new to matcha, it's perfectly healthy to drink 1-2 servings a day and to add more as your body adjusts over time. There is no known risk to drinking too much matcha. 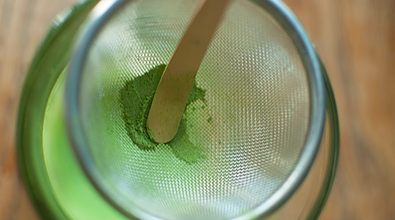 Use your matcha tea spoon (chashaku ) to measure and sift your matcha powder through the tea strainer. Or if you prefer, use the western measuring spoons. 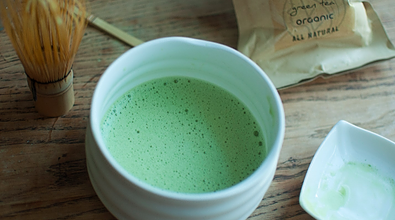 Use the back of the tea spoon to press the matcha through the strainer, breaking down any clumps that form. Heat filtered spring water until steaming and add few drops into the bowl to create a thin paste; this will help ensure the powder is blended evenly. 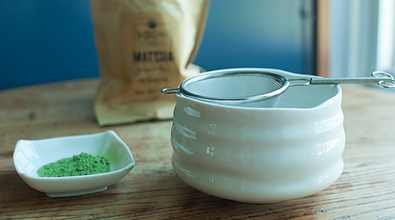 Holding the bowl tightly, quickly whisk the matcha for one to two minutes –avoiding the circular motion—instead using a back and forth motion in the shape of an 'M’. In traditional preparation of matcha, the chasen (bamboo whisk) does not touch the bottom of the bowl while whisking. Once there are no lumps left in the bowl and the matcha has formed a deep green layer of foam, it's ready to be enjoyed from your bowl. To combat the natural bitterness in matcha, it is traditionally served with a small sweet that is eaten before drinking the tea. You can also mix sugar into your matcha or brew it with milk. Unopened matcha packets can be stored in cool, dark places away from heat and sunlight. Once you have opened a packet it should be drunk as soon as possible to maximize freshness.